Previously, we reported that the frequency of micronucleated reticulocytes (MNRETs) in the peripheral blood of male C3H/He mice intraperitoneally administered ethylnitrosourea (ENU) (25 mg/kg body weight) in the dark period (zeitgeber time, ZT15) was higher than in the light period (ZT3). In this study, to clarify the mechanism underlying this phenomenon, we investigated the differences in micronucleus (MN) induction observed between ZT3 and ZT15 using five chemicals, methylnitrosourea (MNU), ethylmethane sulfonate (EMS), mitomycin C, cyclophosphamide and vincristin. MNU and EMS, monofunctional alkylating agents, showed higher frequencies of MNRETs in the ZT15 than the ZT3 treatment similar to ENU. However, no differences were observed for the other chemicals. 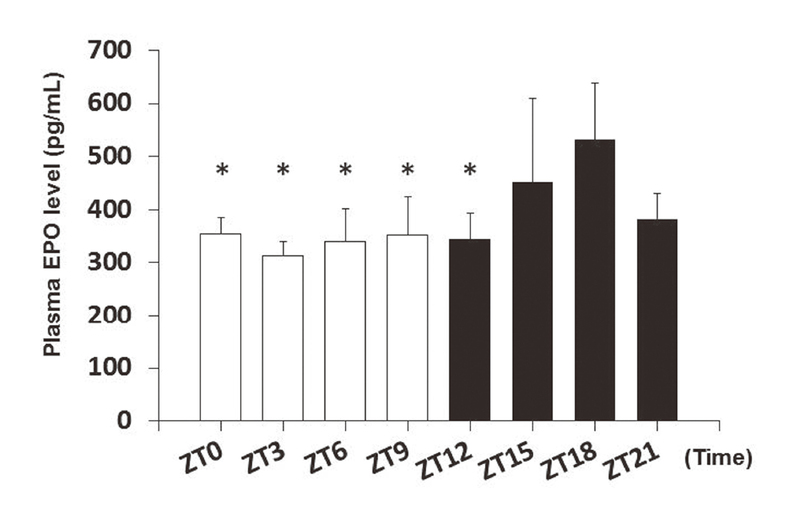 In the comet assay, more DNA damage was induced by ENU in the ZT15 than the ZT3 treatment. Furthermore, the plasma erythropoietin (EPO) level, a known effector of MN induction with anti-apoptotic activity mediated by Bcl-xL expression, was higher in the dark than in the light period. EPO did not increase the frequency of MNRETs. However, in the ENU treatment group at ZT3 following EPO injection a significant increase of MNRETs was observed similar to the ZT15 treatment. Higher expression of apoptosis-related genes such as Bcl-xL was induced in bone marrow cells from mice treated with ENU at ZT15 compared with ZT3. From these results, it was speculated that the differences in MN induction in the peripheral blood of mice exposed to monofunctional alkylating agents such as ENU depend on apoptotic or anti-apoptotic conditions related to the circadian rhythms of EPO in bone marrow. Most organisms, including human beings, have a circadian rhythm that displays an endogenous oscillation of approximately 24 hr and is synchronized to a light/dark cycle by light exposure (Aton and Herzog, 2005) and/or food consumption in the morning (Husse et al., 2015). Various physiological processes in mammals, including excretion of endogenous hormones and metabolism of ingested compounds such as medicine, are influenced by this 24 hr biorhythm. In general, humans are exposed to many chemicals such as those found in cigarette smoke and exhaust gas from automobiles during the daytime (light period), which is the active phase for humans. Experimental animals such as rodents are also usually given chemicals in the light period in non-clinical safety studies. However, the light period is an inactive phase for mice and rats, which are nocturnal rodents. Thus, in some cases, biological responses to chemicals may have been measured from experimental animals in their inactive states. Previously we carried out a micronucleus (MN) test using male C3H/He mice to assess differences in genotoxic sensitivity to ethylnitrosourea (ENU) by varying the dosage time. C3H/He mice have a melatonin rhythm, whereas melatonin is undetectable in other commonly used mouse strains, such as BALB/c and DBA/2 mice (Kennaway et al., 2002; Masana et al., 2000). ENU is a monofunctional alkylating agent and has genotoxic effects at a low dose. We reported that the frequency of micronucleated peripheral reticulocytes (MNRETs) of C3H/He mice intraperitoneally treated with ENU (25 mg/kg body weight) in the dark period (zeitgeber time, ZT15 and 18) was higher than that in the light period (ZT3, 6 and 12) (Itoh et al., 2012). These results suggest that genotoxic sensitivity to chemicals might be affected by physiological reactions related to circadian rhythms. Incidentally, some reports showed MN induction was enhanced by erythropoietin (EPO) treatment (Suzuki et al., 1989; Yajima et al., 1993). In humans, the circadian rhythm of the serum EPO level was found to be at the lowest level at 08.00 (light period) and the highest level at 20.00 (dark period) (Wide et al., 1989). In rodents, Ohkura et al. (2007) showed that the serum EPO level of male C3H/HeN mice in the dark period (ZT20) was higher than that in the light period (ZT5). EPO is a hormone that promotes the formation of red blood cells by bone marrow and binds with the cell surface EPO receptor (EPOR) coupled with JAK2 kinase (Wojchowski et al., 2010). Activation by EPO/EPOR signaling pathways, JAK/STAT, PI3-AKT, and Ras-ERK induces gene expression of Bcl-2 and Bcl-xL and in turn, these molecules (Gross et al., 1999) lead to anti-apoptotic effects (Richmond et al., 2005; Fisher, 1997; Lisowska et al., 2011). However, the detailed mechanisms related to EPO and MN induction have not been clarified yet. In this study, to clarify the mechanisms underlying this phenomenon, we first investigated whether the differences in MN induction were also observed between light and dark periods using five chemicals. Methylnitrosourea (MNU) and ethylmethane sulfonate (EMS) are monofunctional small alkylating agents, though each chemical employs a different mechanism of alkylation (Guérard et al., 2015). Mitomycin C (MMC) is a bifunctional alkylating agent that forms DNA interstrand crosslinks. Cyclophosphamide (CP) is a bifunctional alkylating agent that requires metabolic activation in the liver. These four chemicals–induced DNA damage is repaired by DNA repair system specific for each DNA damage. For monofunctional alkylating agents, alkylated bases in DNA are mainly repaired by base excision repair and mismatch repair (MMR) (Puyo et al., 2014). Vincristin (VINC) is an antimicrotubule agent from the vinca alkaloid family. These five chemicals induce high frequencies of MNRETs in mice (Kondo et al., 1992; Kondo and Ozawa, 1992). Furthermore, we investigated differences in DNA damage in the bone marrow cells of mice exposed to ENU at light and dark dosage times by the comet assay. Moreover, we determined the plasma EPO levels in light and dark periods in mice and investigated the effects of ENU treatment with EPO on MN induction. We focused on EPO function and expression of apoptosis related genes such as Bax, Bcl-2 and Bcl-xL after ENU treatment. ENU was purchased from Toronto Research Chemicals (North York, Ontario, Canada). MNU and EMS were purchased from Sigma-Aldrich (St. Louis, MO, USA). MMC was purchased from Kyowa Hakko Kirin (Tokyo, Japan). CP was purchased from Shionogi (Osaka, Japan). VINC was purchased from Tocris Bioscience (Bristol, UK). EPO (mouse recombinant) was purchased from R&D Systems (Minneapolis, MN, USA). Male C3H/He Slc mice, 8 weeks old, were purchased from Japan SLC, Inc. (Shizuoka, Japan). The animals were housed individually in polycarbonate cages with ALPHA-dri bedding material (Shepherd Special Paper, Watertown, TN, USA), and allowed free access to tap water from a water bottle and a commercial diet sterilized by radiation (CRF-1, Oriental Yeast Co., Tokyo, Japan). The environmental conditions in the animal room were designed to control temperature (23 ± 3°C), relative humidity (55 ± 20%), and a 12-hr light / 12-hr dark cycle [lights on at 8:00 = Zeitgeber time (ZT) 0]. All animals were acclimatized to laboratory conditions for at least 11 days until the initiation of the experiment. Five animals were allocated to each group after the acclimation period, and housed individually. The handling and treatment of the animals during the dark period [from ZT12 to ZT24 (0)] were undertaken under red light to avoid light exposure because mice are insensitive to long wavelengths such as red light (Conway, 2007; Jacobs et al., 2007). The experimental protocol was reviewed and approved by the Institutional Animal Care and Use Committee of Biosafety Research Center (BSRC, Shizuoka, Japan). All animal experiments were conducted in compliance with the Act on Welfare and Management of Animals, Standards Relating to the Care and Management of Laboratory Animals and the Relief of Pain and Guidance for Animal Testing of the BSRC. ENU was dissolved in 1/15 M phosphate buffer. MNU, EMS, MMC, CP and VINC were dissolved in saline. The dosing levels of these chemicals were based on previous papers (Cammerer et al., 2007; Hatanaka et al., 1992; Kondo and Ozawa., 1992; Lee et al., 1998). The chemicals were administered once by intraperitoneal injection to mice at 1 mL per 10 g of body weight. The administration time points were set at ZT3 and ZT15 as the same time points in our previous study using ENU. Five microliters of peripheral blood was collected from the tail vein of each mouse just before treatment (negative control), and 24, 48 and 72 hr after treatment. For the MN test where the effects of EPO were investigated, EPO was dissolved in saline and injected intravenously at ZT1. The dosing volume of EPO was 0.1 mL per 10 g of body weight. The dosing concentration of EPO was set as 200 pg/mL calculated from the highest and lowest EPO values in a day. Dose of EPO was calculated as 14.4 ng/kg, refer to the circulating blood volume in mouse (0.72 mL per 10 g of body weight) (Diehl et al., 2001). The MN test was conducted using the same method as described above for just before treatment (negative control), and 24, 48 and 72 hr after treatment. Each blood sample was placed on acridine orange-coated slides according to the procedure described by Hayashi et al. (1990). On each slide, 1000 peripheral reticulocytes per mouse were examined for the presence of micronuclei using fluorescence microscopy (Ex: 488 nm, Em: 515 nm). Bone marrow cells were collected from the one-sided femur of a mouse just before treatment (negative control), and 3, 6, 12 and 24 hr after ENU treatment. The preparation of the cell sample and electrophoresis of the comet slides were performed according to the validation study protocol (version 14.2) (Uno et al., 2015) and the methods described by Hobbs et al. (2015). The collected bone marrow cells were rinsed with cold mincing buffer and partly divided as a cell suspension. A portion of the cell suspension (10 µL) was diluted with 0.5% low-melting point agarose gel (90 µL), and 90 µL of this gel was layered onto microscope slides precoated with 1.0% normal melting point agarose gel. Low-melting point agarose gel was applied as a top layer over the gel-embedded slides. The slides were electrophoresed for 20 min at 0.7 V/cm with a constant voltage of approximately 300 mA. The cells were fluorescently stained with SYBR-Gold (Life Technologies LTD, Renfrewshire, UK) and 50 cells per animal were analyzed for their % tail DNA using a Comet Assay IV image analyzer (Perceptive Instruments Ltd., Suffolk, UK). Blood samples were collected from the abdominal aorta of mice under isoflurane anesthesia using blood-collecting tubes containing an anticoagulant (heparin lithium) at ZT0, 3, 6, 9, 12, 15, 18 and 21. After blood sampling, blood was centrifuged at 2,000 × g for 20 min at 4°C to obtain the plasma. The plasma samples were stored at -20°C until EPO measurement. Plasma EPO levels were measured using the Mouse Erythropoietin Quantikine ELISA Kit (R&D Systems, Minneapolis, MN, USA) according to the manufacturer’s instructions. Bone marrow cells were removed from the femur of a mouse just before treatment (negative control), and 3, 6 and 12 hr after ENU treatment. Total RNA was extracted from bone marrow cells by a guanidium thiocyanate-phenol-chloroform extraction method using TRIzol reagent (Invitrogen, Carlsbad, CA, USA), and cDNA was synthesized using the PrimeScript RT reagent kit (Takara Bio Inc., Tokyo, Japan). Power SYBR Green PCR Master Mix (Life Technologies LTD, Renfrewshire, UK) was used for real-time PCR with the Step One Real Time PCR System (Applied Biosystems, Foster City, CA, USA). Amplification was performed with the following PCR reaction conditions: 95°C for 10 min, 50 cycles of 95°C for 15 sec, and 60°C for 1 min. After PCR, melting curves were acquired by stepwise increases in temperature from 60°C to 95°C to ensure that a single product was amplified in the reaction. Gene expression was normalized to the endogenous housekeeping gene β-actin. The relative mRNA expression of the Bax, Bcl-2 and Bcl-xL genes were calculated by the comparative automatic threshold cycles method. The relative differences in expression between groups were expressed as relative increases by setting the ZT3 (0 hr) as 1. The PCR primers for Bax were 5’-CATGTTTGCTGATGGCAACTTC-3’ (forward) and 5’-CACAAAGATGGTCACTGTCTGC-3’ (reverse), the primers for Bcl-2 were 5’-GATGACTTCTCTCGTCGCTACC-3’ (forward) and 5’-CGGTTCAGGTACTCAGTCATCC-3’ (reverse), the primers for Bcl-xL were 5’-CAAGCTTTCCCAGAAAGG-3’ (forward) and 5’-TGAAGAGTGAGCCCAGCA-3’ (reverse), and the primers for β-actin were 5’-GGCTGTATTCCCCTCCATCG-3’ (forward) and 5’-CCAGTTGTTAACAATGCCATGT-3’ (reverse), and all were purchased from Rikaken Co., Ltd. (Aichi, Japan). All data are expressed as the means ± S.D. The statistical analysis of each time point between ZT3 and ZT15 in the time course experiment was performed using the method of Kastenbaum and Bowman (1970) for the MNRETs frequencies. The multiple comparisons were conducted by the Tukey method to analyze the differences in the results of plasma EPO concentrations among the time points or in the frequencies of the MNRETs. The relative ratios of mRNA expression were analyzed by the F-test method. When homoscedasticity was observed in the F-test, the data were analyzed by the Student’s t-test. When no homoscedasticity was observed in the F-test, the data were analyzed by the Aspin-Welch test. The F-test and t-test were used to evaluate the control and ZT3 or ZT15 treatment groups, or ZT3 and ZT15 treatment groups. Differences at P < 0.05 were considered statistically significant. All statistical analyses were conducted using SAS, version 9.3 (SAS Institute Inc., Cary, NC, USA). All chemicals produced the highest frequencies of MNRETs at 48 hr after both the ZT3 (light period) and ZT15 (dark period) treatments. In the MNU and EMS groups at 48 hr after treatment, the higher frequencies of MNRETs at ZT15 were statistically significant compared with those at ZT3 (Fig. 1A). In the MMC, CP or VINC treatment groups, there were no differences in the frequencies of MNRETs between the ZT3 and ZT15 treatments (Fig. 1B). For all chemicals, the frequencies of MNRETs increased dose-dependently for both the ZT3 and ZT15 treatments. Time course of the percent of MNRETs based on 1000 RETs assessed per mouse after intraperitoneal administration of MNU (A: 15 mg/kg, B: 30 mg/kg) or EMS (C: 125 mg/kg, D: 250 mg/kg) at ZT3 (open circles) or ZT15 (dark circles). The data represent the mean value ± S.D. from five mice. * P < 0.05: compared with the ZT3 values of each time point by the Kastenbaum and Bowman method. Time course of the percent of MNRETs based on 1000 RETs assessed per mouse after intraperitoneal administration of MMC (A: 0.5 mg/kg, B: 1 mg/kg), CP (C: 15 mg/kg, D: 30 mg/kg) or VINC (E: 0.05 mg/kg, F: 0.1 mg/kg) at ZT3 (open circles) or ZT15 (dark circles). The data represent the mean value ± S.D. from three to five mice. There were no significant differences between the ZT3 and ZT15 values of each time point by the Kastenbaum and Bowman method. In the ZT3 treatment group, the amounts of DNA damage quantified as the % tail DNA at 3, 6 and 12 hr after treatment were statistically significantly higher than those of the control group. In the ZT15 treatment group, the amounts of % tail DNA at 3 and 6 hr after treatment were higher and statistically significant compared with those of the control group. The highest value of % tail DNA was observed at 3 hr after treatment in both the ZT3 and ZT15 groups. There was no statistical significance in the % tail DNA between the ZT3 and ZT15 treatment groups however there was a tendency to observe a higher value in the ZT15 group than the ZT3 group at 3 hr after treatment (Fig. 2). Time course of the frequency of the % tail DNA of bone marrow cells prepared from mice after intraperitoneal administration of ENU 25 mg/kg body weight at ZT3 (control group: white bar, treated group: black diagonal lines) or ZT15 (control group: cross-hatching, treated group: black bar) as analyzed by the Comet assay. The data represent the mean ± S.D. from three to five mice. * P < 0.05: compared with the control value of each time point by the Student’s t-test. There were no significant differences between the ZT3 and ZT15 treated groups at each time point. However, there was a tendency to observe a higher value in the ZT15 treated group than the ZT3 treated group at 3 hr after administration. EPO concentrations in non-treated C3H/He male mouse plasma were measured by ELISA every 3 hr from ZT0 (Fig. 3). The lowest value of EPO concentration was about 300 pg/mL at ZT3 and the highest value was about 500 pg/mL at ZT18. The EPO in plasma differed by about 200 pg/mL in a day. The higher EPO concentration in plasma at ZT18 was statistically significant compared with the values at ZT0, ZT3, ZT6, ZT9 and ZT12. Circadian rhythm of the plasma EPO level in male C3H/He mice. White and black columns show plasma EPO level in light period and dark period, respectively. The data represent the mean ± S.D. from four to five mice. These values were analyzed by Tukey statistical analysis to determine the significant differences between the measurement points. * p < 0.05: compared with the ZT18 value. The effects of EPO on MNRETs induction were investigated. EPO (14.4 ng/kg body weight) was intravenously injected to mice, which make the plasma EPO level at ZT3 almost equal to that at ZT18. In the EPO only treatment group, no increases of any of the measurement points were observed (Fig. 4). However, in the ENU treatment (25 mg/kg body weight) at ZT3 following EPO injection (ENU (ZT3) + EPO (ZT1) group), the frequencies of MNRETs increases similar to the ENU (ZT15) group were observed. At 48 and 72 hr after treatment, the higher frequencies of MNRETs in ENU (ZT3) + EPO (ZT1) group and ENU (ZT15) group were statistically significant compared with that of the EPO only group. At 48 hr after treatment, the frequency of MNRETs in ENU (ZT3) + EPO (ZT1) group was significantly higher than that of the ENU (ZT3) group. Effects of pre-treatment of EPO for MNRETs induced by ENU in male mice. Time course of the percent of MNRETs based on 1000 RETs assessed in the peripheral blood of mice. 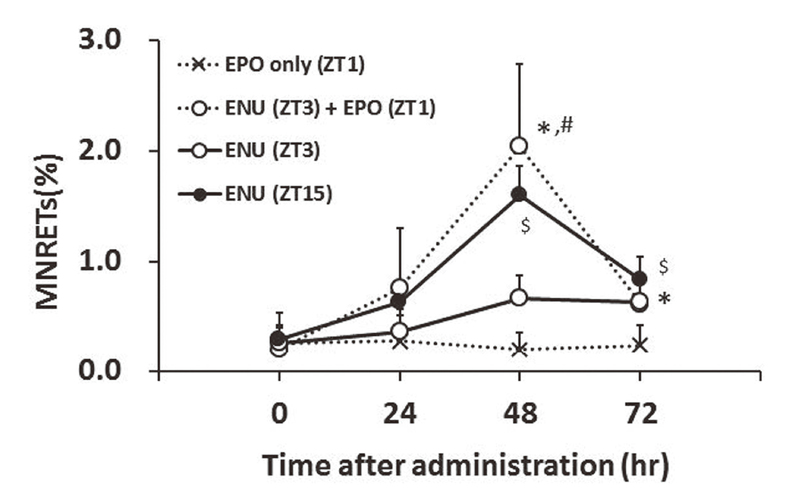 Mice were administered 25 mg/kg of ENU intraperitoneally at ZT3 (open circles) or ZT15 (dark circles and solid line), 25 mg/kg of ENU intraperitoneally at ZT3 after intravenous injection of 200 pg/mL of EPO at ZT1 (dark circles and dotted line), or administered 200 pg/mL of EPO intravenously at ZT1 (cross and dotted line). The data represent the mean values ± S.D. from three or five mice. These values were analyzed by Tukey statistical analysis to determine the significant differences between groups at each time points. * P < 0.05: EPO only (ZT1) group vs ENU (ZT3) + EPO (ZT1) group. $ P < 0.05: EPO only (ZT1) group vs ENU (ZT15) group. # P < 0.05: ENU (ZT3) + EPO (ZT1) group vs ENU (ZT3) group. The Bax gene expression was higher and statistically significant in the ZT3/ENU group compared with the ZT3/control group at 3, 6 and 12 hr after administration. There were no significant changes between the ZT15/control and ZT15/ENU treated groups. At 3 hr after administration, Bax gene expression was higher and statistically significant in the ZT3/ENU group than the ZT15/ENU group (Fig. 5 A). The higher Bcl-2 gene expression was statistically significant in the ZT3/ENU group at 6 and 12 hr after administration and in the ZT15/ENU group at 12 hr after administration compared with the control groups. 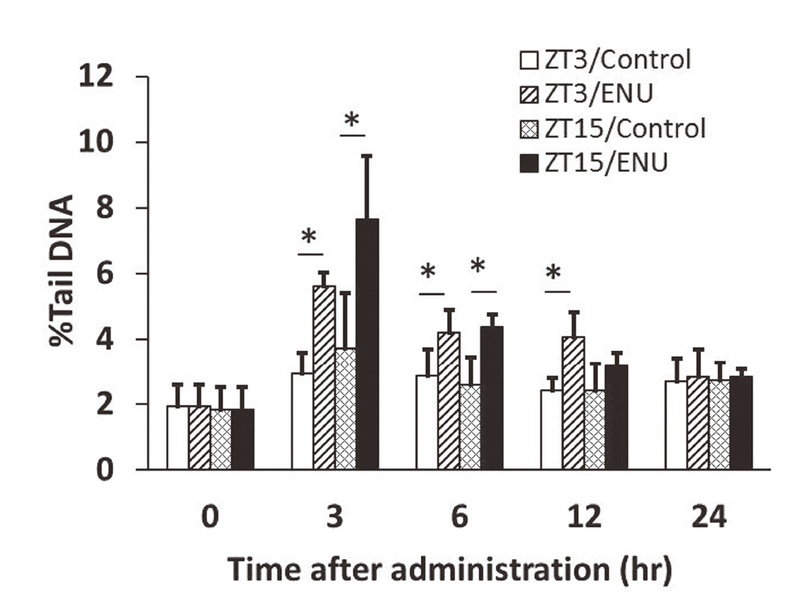 There were no significant changes between the ZT3/ENU and ZT15/ENU treated groups (Fig. 5 B). The higher Bcl-xL gene expression was statistically significant in the ZT15/ENU group at 3 and 12 hr after administration and in the ZT3/ENU group at 6 hr after administration compared with the control groups. At 6 and 12 hr after administration, Bcl-xL gene expression was statistically significant and higher in the ZT15/ENU group compared with the ZT3/ENU group (Fig. 5 C). 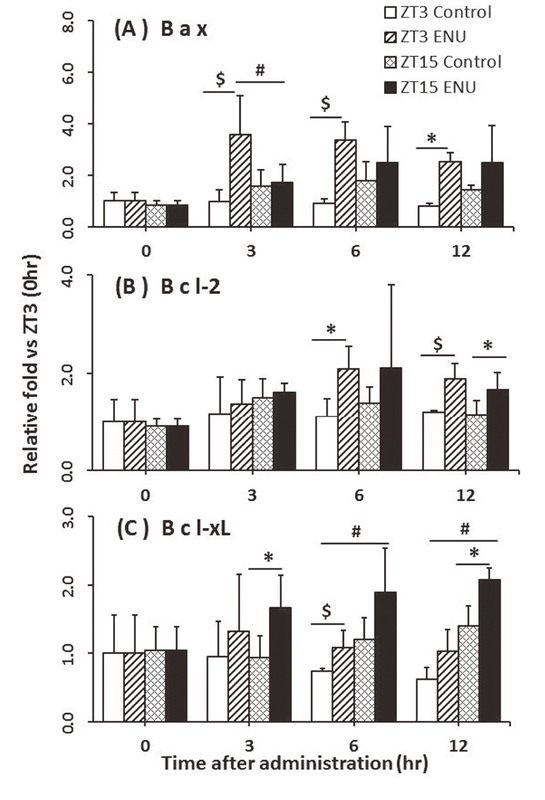 Time course of mRNA expression levels of Bax (A), Bcl-2 (B) and Bcl-xL (C) in bone marrow prepared from mice after intraperitoneal administration of ENU 25 mg/kg body weight at ZT3 (control group: white bar, treated group: black diagonal lines) or ZT15 (control group: cross-hatching, treated group: black bar) as measured by SYBR Green real-time PCR analysis. Each gene expression was normalized to the endogenous housekeeping gene β-actin. The relative differences in expression between groups were expressed as relative increases by setting the ZT3 (0 hr) as 1. The data represent the mean values ± S.D. from three to six mice. * P < 0.05: compared with the control value of each time point by the Student’s t-test. $ P < 0.05: compared with the control value of each time point by the Aspin-Welch test. # P < 0.05: compared between the ZT3 and ZT15 values of each time point by the Student’s t-test. Recently, many studies have been published on chronopharmacology and/or chronobiology based on the circadian rhythm, and clinical therapy has involved chronotherapy or chronopharmacotherapy (Baraldo, 2008; Ohdo, 2010; Reinberg and Smolensky, 1982). In chronopharmacotherapy, the dosing time is changed to account for the circadian rhythm of drug disposition and to match the pattern of symptom appearance in diseases such as asthma bronchiale and high blood pressure. The efficiency and toxicity of medicines vary depending on the dosing time. Although daytime is the inactive phase for nocturnal rodents, they are usually dosed with chemicals in the light period in non-clinical safety studies. Therefore, we have previously reported that different frequencies of MNRETs induced by ENU were observed depending on the administration time. The frequencies of MNRETs induced by ENU increased and peaked at 48 hr after each treatment, and were higher in the groups treated in the dark period than in the light period (Itoh et al., 2012). In this study, ENU, MNU, EMS, MMC, CP and VINC were used for the MN test. ENU is a monofunctional alkylating agent and forms ethylated DNA adducts (Beranek, 1990). MNU and EMS are also monofunctional alkylating agents. MMC and CP form DNA interstrand crosslinks and are used as anti-cancer drugs. VINC is an antimicrotubule agent and inhibits cell division. The highest frequencies of MNRETs induced by all chemicals used in this study were observed at 48 hr after treatment, regardless of the administration time (Fig. 1A, B). These results suggest that the time for the mature process of proerythroblasts and MNRETs transfer into peripheral blood are not affected by circadian rhythm. Results from the MN test demonstrated that the frequency of MNRETs induced by MNU and EMS were higher in the group treated at ZT15 than that at ZT3 (Fig. 1A). 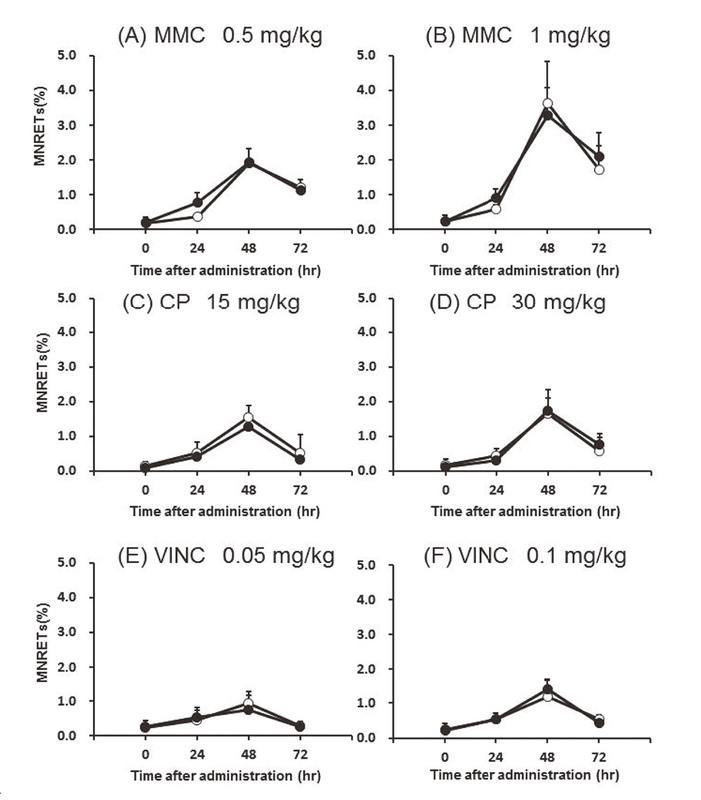 However, this difference in MNRET induction was not observed in other groups treated with MMC, CP or VINC (Fig. 1B). The alkylating agents used in this study are potent mutagens and carcinogens, and form various alkylated bases in DNA. DNA damage induced by monofunctional alkylating agents is repaired by base excision repair, mismatch repair (MMR) and in the case of a methylating agent, direct repair involving MGMT (methylguanine methyl transferase) (Puyo et al., 2014). MGMT specifically repairs O6-methylguanine in DNA by transferring the methyl group to the MGMT enzyme. It has been reported that more tumors occurred in Mgmt-/- mice administered a low dose of MNU than in normal mice (Sakumi et al., 1997). O6-Methylguanine seems to play a critical role in mutagenesis and carcinogenesis. O6-Methylguanine prefers to pair with thymine instead of cytosine during DNA replication if it is not repaired. A G:T mismatch is recognized by the MMR system, which involves proteins encoded by MSH2 (mutS) and MLH1, PMS1 and PMS2 (mutL). Both Mgmt-/- cells and mice showed higher sensitivity to the killing effects of MNU, whereas Mgmt-/- Mlh1-/- double deficient cells and mice were resistant to MNU as well as wild-type cells and mice (Kawate et al., 2000; Takagi et al., 2003). These results suggested MMR deficient cells and mice are resistant to apoptosis and MLH1 protein is a critical factor leading to mutation or apoptosis when damaged cells enter DNA replication. It has been reported that a PCNA-MutSα-MutLα complex bound to mismatched bases induced by O6-methylguanine triggers apoptosis (Hidaka et al., 2005). On the other hand, bifunctional alkylating agents such as MMC and CP form DNA intra- or inter-strand crosslinks, which are repaired by nucleotide excision repair, in addition to alkylation. Double strand brakes are induced after replication of alkylated DNA (Kondo et al., 2010; Puyo et al., 2014). As described above, VINC is a spindle poison and a non-DNA-binding agent (Cammerer et al., 2010). Therefore, the specific DNA repair pathways for monofunctional alkylating agents are considered to be one of the reason for the different frequencies of MNRETs between light and dark periods. MNs are small fragments of chromosomes damaged from a mutagen and formed during mitosis (Luzhna et al., 2013). MNRETs are MNs in reticulocytes, also known as immature erythrocytes, during the differentiation and proliferation processes in bone marrow. 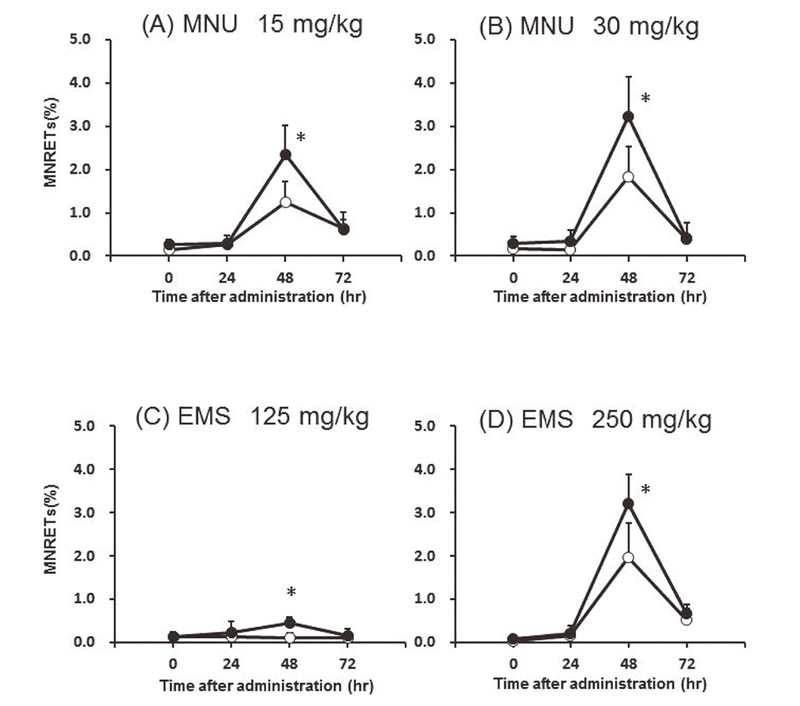 As shown in this study, the incidence of MNRET induced by alkylating agents such as ENU and MNU was affected by the dosing time. To investigate whether DNA damage is also influenced by the dosing time, a comet assay in mouse bone marrow was performed. The incidence of DNA damage as the % tail DNA induced by treatment with ENU at ZT15 tended to be higher than that at ZT3. The same effects were observed as for micronucleus induction. These monofunctional alkylating agents (ENU, MNU and EMS) induce DNA damage without metabolic activation and classified as a direct-acting mutagen/carcinogen, and their half-life is very short (Greenspan et al., 1988; Sekihashi et al., 2003). Though it has been reported that expression of metabolism and detoxification related genes such as Cyp, Ugt, Gst showed circadian profiles (Zhang et al., 2009), circadian effects of metabolic and detoxification enzymes seem unlikely to cause differences in MN induction in the peripheral blood reticulocytes of mice exposed to monofunctional alkylating agents in the light and dark periods. It is likely that dosing time may play a critical role in DNA repair after exposure to monofunctional alkylating agents. It is known that the daily blood levels of several hormones, such as melatonin, cortisol, gonadal steroids, thyroid hormone and growth hormone among others, have a circadian rhythm (Gnocchi and Bruscalupi, 2017). EPO is one such hormone that shows a circadian rhythm (Firsov and Bonny, 2010). In this study, we confirmed there was a higher plasma EPO level in the dark period than the light period (Fig. 3). This variation in the pattern of plasma EPO level is similar to that of MNRET incidence after a 48 hr treatment with ENU. It has been reported that the frequencies of MNRETs were enhanced by EPO treatment (Yajima et al., 1993). However, in that study a high incidence of MN was shown only in the high concentration EPO treatment group (400 IU; 3.36 µg/kg body weight, intraperitoneal injection). As shown in Fig. 4, no increase in MNRET incidence was observed in the EPO only treatment group (14.4 ng/kg body weight). The plasma EPO level at ZT3 was almost equal to that at ZT18 after injection with a deficient amount of EPO, while the incidence of MNRETs induced by ENU at ZT3 in the light period was enhanced and showed a similar incidence as that observed from ZT15 treatment. These results suggest that the incidence of MNRETs induced with ENU is related to EPO function. EPO prevents the apoptotic cell death of immature erythroblasts (Silva et al., 1999). After ENU treatment, the time-course of expression of the apoptosis-related genes, bax, bcl-2 and bcl-xL, were measured in this study. The ZT3 treatment group showed higher expression of the pro-apoptotic bax gene, while the ZT15 treatment group showed higher expression of the anti-apoptotic bcl-xL gene. Therefore, ENU treatment during the light period seems to enhance cell apoptosis more than the dark period. Anti-apoptic effects are considered to be stronger in the dark period than in the light period because the plasma EPO level was higher in the dark period. Moreover, apoptosis was reported to be one of the ways in which MNs and/or micronucleated cells disappear (Hintzsche et al., 2017). We speculate that O6-methylguanine induced apoptosis through a mismatch repair, which involves MLH1, MSH2 etc., may be inhibited by EPO function when mice were treated with monofunctional alkylating agents such as MNU in the dark period. Hence, the number of O6-methylguanine-accumulated cells increased by inhibiting apoptosis resulting in a higher number of cells with MN in the dark period treatment group. In conclusion, we demonstrated that the frequencies of MNRETs induced by monofunctional alkylating agents, such as ENU, MNU and EMS, were higher in mice treated during the dark period than the light period and that the plasma EPO level was higher in the dark period. Further, higher expression of anti-apoptotic Bcl-xL gene was observed in bone marrow cells from mice treated with ENU in the dark period. One reason for the differences in MN induction by dosing time is speculated to be the variable nature of the anti-apoptotic effect of EPO on the mismatch repair process after treatment with monofunctional alkylating agents between the light and dark periods. Future study is needed to prove the mechanism of this phenomenon. Moreover, the dosing time for studies using laboratory animals should be carefully considered because animals may experience varying biological reactions related to their circadian rhythms. This work was partly supported by JSPS KAKENHI grant number 22510070 (KS). We thank Renee Mosi, PhD, from Edanz Group (https://www.edanzediting.com/ac) for editing a draft of this manuscript. Aton, S.J. and Herzog, E.D. (2005): Come together, right...now: synchronization of rhythms in a mammalian circadian clock. Neuron, 48, 531-534. Baraldo, M. (2008): The influence of circadian rhythms on the kinetics of drugs in humans. Expert Opin. Drug Metab. Toxicol., 4, 175-192. Beranek, D.T. (1990): Distribution of methyl and ethyl adducts following alkylation with monofunctional alkylating agents. Mutat. Res., 231, 11-30. Cammerer, Z., Elhajouji, A., Kirsch-Volders, M. and Suter, W. (2007): Comparison of the peripheral blood micronucleus test using flow cytometry in rat and mouse exposed to aneugens after single-dose applications. Mutagenesis, 22, 129-134. Cammerer, Z., Schumacher, M.M., Kirsch-Volders, M., Suter, W. and Elhajouji, A. (2010): Flow cytometry peripheral blood micronucleus test in vivo: determination of potential thresholds for aneuploidy induced by spindle poisons. Environ. Mol. Mutagen., 51, 278-284. Conway, B.R. (2007): Color vision: mice see hue too. Curr. Biol., 17, R457-R460. Diehl, K.H., Hull, R., Morton, D., Pfister, R., Rabemampianina, Y., Smith, D., Vidal, J.M. and van de Vorstenbosch, C.; European Federation of Pharmaceutical Industries Association and European Centre for the Validation of Alternative Methods. (2001): A good practice guide to the administration of substances and removal of blood, including routes and volumes. J. Appl. Toxicol., 21, 15-23. Firsov, D. and Bonny, O. (2010): Circadian regulation of renal function. Kidney Int., 78, 640-645. Fisher, J.W. (1997): Erythropoietin: physiologic and pharmacologic aspects. Proc. Soc. Exp. Biol. Med., 216, 358-369. Gnocchi, D. and Bruscalupi, G. (2017): Circadian rhythms and hormonal homeostasis: pathophysiological implications. Biology (Basel), 6, 10. Greenspan, J.A., Xu, F.M. and Davidson, R.L. (1988): Molecular analysis of ethyl methanesulfonate-induced reversion of a chromosomally integrated mutant shuttle vector gene in mammalian cells. Mol. Cell. Biol., 8, 4185-4189. Gross, A., McDonnell, J.M. and Korsmeyer, S.J. (1999): BCL-2 family members and the mitochondria in apoptosis. Genes Dev., 13, 1899-1911. Guérard, M., Baum, M., Bitsch, A., Eisenbrand, G., Elhajouji, A., Epe, B., Habermeyer, M., Kaina, B., Martus, H.J., Pfuhler, S., Schmitz, C., Sutter, A., Thomas, A.D., Ziemann, C. and Froetschl, R. (2015): Assessment of mechanisms driving non-linear dose-response relationships in genotoxicity testing. Mutat. Res. Rev. Mutat. Res., 763, 181-201. Hatanaka, Y., Kitagawa, Y., Toyoda, Y., Kawata, T., Ando, N., Kawabata, Y., Iwai, M. and Arimura, H. (1992): Micronucleus test with cyclophosphamide using mouse peripheral blood reticulocytes. Mutat. Res., 278, 99-101. Hayashi, M., Morita, T., Kodama, Y., Sofuni, T. and Ishidate, M. Jr. (1990): The micronucleus assay with mouse peripheral blood reticulocytes using acridine orange-coated slides. Mutat. Res., 245, 245-249. Hidaka, M., Takagi, Y., Takano, T.Y. and Sekiguchi, M. (2005): PCNA-MutSalpha-mediated binding of MutLalpha to replicative DNA with mismatched bases to induce apoptosis in human cells. Nucleic Acids Res., 33, 5703-5712. Hintzsche, H., Hemmann, U., Poth, A., Utesch, D., Lott, J. and Stopper, H.; Working Group “In vitro micronucleus test”, Gesellschaft für Umwelt-Mutationsforschung (GUM, German-speaking section of the European Environmental Mutagenesis and Genomics Society EEMGS). (2017): Fate of micronuclei and micronucleated cells. Mutat. Res., 771, 85-98. Hobbs, C.A., Recio, L., Streicker, M., Boyle, M.H., Tanaka, J., Shiga, A. and Witt, K.L. (2015): Comet assay evaluation of six chemicals of known genotoxic potential in rats. Mutat. Res. Genet. Toxicol. Environ. Mutagen., 786-788, 172-181. Husse, J., Eichele, G. and Oster, H. (2015): Synchronization of the mammalian circadian timing system: Light can control peripheral clocks independently of the SCN clock: alternate routes of entrainment optimize the alignment of the body’s circadian clock network with external time. BioEssays, 37, 1119-1128. Itoh, K., Masumori, S., Nakajima, M., Hayashi, M., Sakakibara, H. and Shimoi, K. (2012): Differences in micronucleus induction in peripheral blood reticulocytes of mice exposed to N-ethyl-N-nitrosourea at light and dark dosing times. J. Toxicol. Sci., 37, 427-430. Jacobs, G.H., Williams, G.A., Cahill, H. and Nathans, J. (2007): Emergence of novel color vision in mice engineered to express a human cone photopigment. Science, 315, 1723-1725. Kastenbaum, M.A. and Bowman, K.O. (1970): Tables for determining the statistical significance of mutation frequencies. Mutat. Res., 9, 527-549. Kawate, H., Itoh, R., Sakumi, K., Nakabeppu, Y., Tsuzuki, T., Ide, F., Ishikawa, T., Noda, T., Nawata, H. and Sekiguchi, M. (2000): A defect in a single allele of the Mlh1 gene causes dissociation of the killing and tumorigenic actions of an alkylating carcinogen in methyltransferase-deficient mice. Carcinogenesis, 21, 301-305. Kennaway, D.J., Voultsios, A., Varcoe, T.J. and Moyer, R.W. (2002): Melatonin in mice: rhythms, response to light, adrenergic stimulation, and metabolism. Am. J. Physiol. Regul. Integr. Comp. Physiol., 282, R358-R365. Kondo, K. and Ozawa, S. (1992): Micronucleus test with ethyl methanesulfonate in mouse peripheral blood reticulocytes stained supravitally using acridine orange-coated slides. Mutat. Res., 278, 109-111. Kondo, N., Takahashi, A., Ono, K. and Ohnishi, T. (2010): DNA damage induced by alkylating agents and repair pathways. J. Nucleic Acids, 2010, 543531. Kondo, Y., Honda, S., Nakajima, M., Miyahana, K., Hayashi, M., Shinagawa, Y., Sato, S., Inoue, K., Nito, S. and Ariyuki, F. (1992): Micronucleus test with vincristine sulfate and colchicine in peripheral blood reticulocytes of mice using acridine orange supravital staining. Mutat. Res., 278, 187-191. Luzhna, L., Kathiria, P. and Kovalchuk, O. (2013): Micronuclei in genotoxicity assessment: from genetics to epigenetics and beyond. Front. Genet., 4, 131. Lee, J., Kim, N., Choi, J., Kim, Y., Heo, M., Lim, S. and Park, K. (1998): Inhibitory effects of the methanolic extract of an edible brown alga, ecklonia stolonifera and its component, phloroglucinol on aflatoxin B1 mutagenicity in vitro (Ames test) and on benzo(a)pyrene or N-methyl N-nitrosourea clastogenicity in vivo (mouse micronucleus test). Nat. Prod. Sci., 4, 105-114. Lisowska, K.A., Jasiulewicz, A., Bryl, E. and Witkowski, J.M. (2011): Erythropoietin as an immunomodulating agent. Nephrourol. Mon., 3, 247-251. Masana, M.I., Benloucif, S. and Dubocovich, M.L. (2000): Circadian rhythm of mt1 melatonin receptor expression in the suprachiasmatic nucleus of the C3H/HeN mouse. J. Pineal Res., 28, 185-192. Ohdo, S. (2010): Chronotherapeutic strategy: rhythm monitoring, manipulation and disruption. Adv. Drug Deliv. Rev., 62, 859-875. Ohkura, N., Oishi, K., Sekine, Y., Atsumi, G., Ishida, N., Matsuda, J. and Horie, S. (2007): Comparative study of circadian variation in numbers of peripheral blood cells among mouse strains: unique feature of C3H/HeN mice. Biol. Pharm. Bull., 30, 1177-1180. Puyo, S., Montaudon, D. and Pourquier, P. (2014): From old alkylating agents to new minor groove binders. Crit. Rev. Oncol. Hematol., 89, 43-61. Reinberg, A. and Smolensky, M.H. (1982): Circadian changes of drug disposition in man. Clin. Pharmacokinet., 7, 401-420. Richmond, T.D., Chohan, M. and Barber, D.L. (2005): Turning cells red: signal transduction mediated by erythropoietin. Trends Cell Biol., 15, 146-155. Sakumi, K., Shiraishi, A., Shimizu, S., Tsuzuki, T., Ishikawa, T. and Sekiguchi, M. (1997): Methylnitrosourea-induced tumorigenesis in MGMT gene knockout mice. Cancer Res., 57, 2415-2418. Sekihashi, K., Saitoh, H., Saga, A., Hori, K., Nakagawa, M., Miyagawa, M. and Sasaki, Y.F. (2003): Effect of in vitro exposure time on comet assay results. Environ. Mutagen Res., 25, 83-86. Silva, M., Benito, A., Sanz, C., Prosper, F., Ekhterae, D., Nuñez, G. and Fernandez-Luna, J.L. (1999): Erythropoietin can induce the expression of bcl-x(L) through Stat5 in erythropoietin-dependent progenitor cell lines. J. Biol. Chem., 274, 22165-22169. Suzuki, Y., Nagae, Y., Ishikawa, T., Watanabe, Y., Nagashima, T., Matsukubo, K. and Shimizu, H. (1989): Effect of erythropoietin on the micronucleus test. Environ. Mol. Mutagen., 13, 314-318. Takagi, Y., Takahashi, M., Sanada, M., Ito, R., Yamaizumi, M. and Sekiguchi, M. (2003): Roles of MGMT and MLH1 proteins in alkylation-induced apoptosis and mutagenesis. DNA Repair (Amst. ), 2, 1135-1146. Uno, Y., Kojima, H., Omori, T., Corvi, R., Honma, M., Schechtman, L.M., Tice, R.R., Beevers, C., De Boeck, M., Burlinson, B., Hobbs, C.A., Kitamoto, S., Kraynak, A.R., McNamee, J., Nakagawa, Y., Pant, K., Plappert-Helbig, U., Priestley, C., Takasawa, H., Wada, K., Wirnitzer, U., Asano, N., Escobar, P.A., Lovell, D., Morita, T., Nakajima, M., Ohno, Y. and Hayashi, M. (2015): JaCVAM-organized international validation study of the in vivo rodent alkaline comet assay for detection of genotoxic carcinogens: II. Summary of definitive validation study results. Mutat. Res. Genet. Toxicol. Environ. Mutagen., 786-788, 45-76. Wide, L., Bengtsson, C. and Birgegård, G. (1989): Circadian rhythm of erythropoietin in human serum. Br. J. Haematol., 72, 85-90. Wojchowski, D.M., Sathyanarayana, P. and Dev, A. (2010): Erythropoietin receptor response circuits. Curr. Opin. Hematol., 17, 169-176. Yajima, N., Kurata, Y., Sawai, T. and Takeshita, Y. (1993): Induction of micronucleated erythrocytes by recombinant human erythropoietin. Mutagenesis, 8, 221-229. Zhang, Y.K., Yeager, R.L. and Klaassen, C.D. (2009): Circadian expression profiles of drug-processing genes and transcription factors in mouse liver. Drug Metab. Dispos., 37, 106-115.